Location is great. Owner is great. Room is clean and with the nice view. Everything, the place is so beautiful and luxurious, very comfortable for 3 of us. Just a few step to shopping area. Love it. It would be nice to have a comceirge service in the residence or a restaurant perhaps! Excellet quality of the facilities, super modern, stylish, new place. Good size and modern, location 10 mins from train station, 10 minutes from a great food court in an interesting building! Nespresso machine good. Close to shopping areas. However I will like to thank you for de wash machine en dryer very helpful. The location perfect. It was awesome but verry sad that i couldn't watch tv the whole weekend that is one thing that bother me the whole staying. 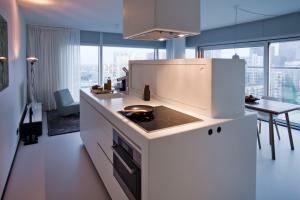 Lock in a great price for Urban Residences Rotterdam – rated 9 by recent guests! Urban Residences Rotterdam This rating is a reflection of how the property compares to the industry standard when it comes to price, facilities and services available. It's based on a self-evaluation by the property. Use this rating to help choose your stay! 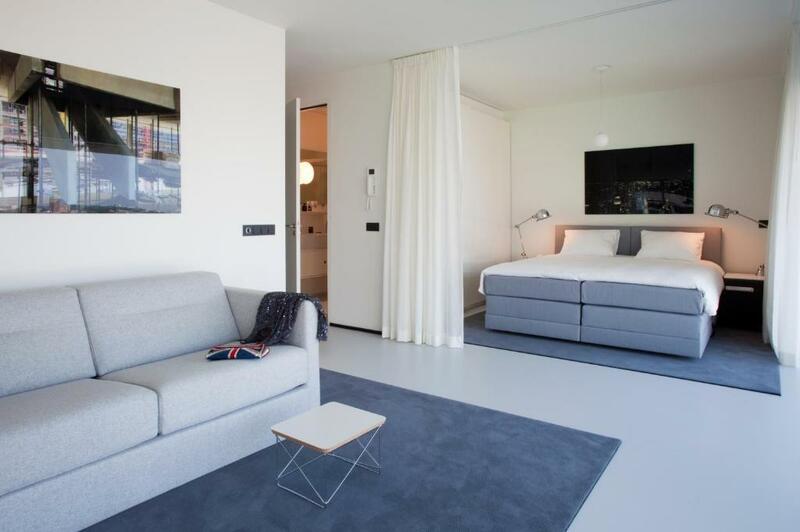 One of our top picks in Rotterdam.Located in the heart of Rotterdam, Urban Residences offers luxurious apartments with floor-to-ceiling windows and design elements by high-end brands Alessi, Vitra and Flos. The most famous shopping streets of Rotterdam - De Koopgoot and De Lijnbaan - are a 2 minute walk away. The main attractions of Rotterdam are easily accessible by foot. The architecturally renowned Markthal, Witte de Withstraat en De Meent are ideal for lunch, drinks and dinner. The nearest supermarket Albert Heijn, De Doelen, the City Hall and the World Trade Center are only a couple of minutes away by foot. Rotterdam Central Station is less than 0.6 mi away, a walk of approximately 10 minutes. 뀐 Located in the real heart of Rotterdam, this property has an excellent location score of 9.7! 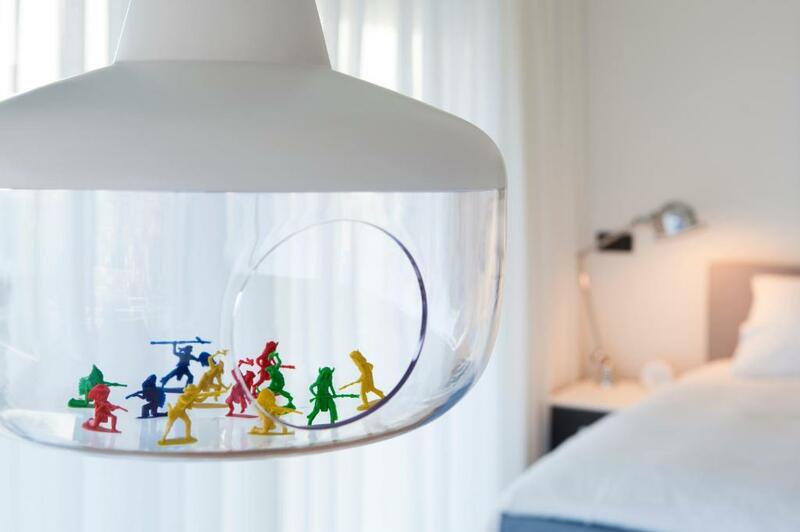 When would you like to stay at Urban Residences Rotterdam? This apartment is located between the 13th and 18th floor and consists of a living room, a fully-equipped designer kitchen, a private bathroom with a shower and a bath, and 2 bedrooms. A flat-screen TV can be found in the salon and both bedrooms. The maximum occupancy of this apartment is 4 people, and 1 baby under 3 years of age (baby cot obligatory). Each large apartment has a spacious balcony with outdoor furniture and panoramic city views. Private parking is available on site (reservation is not needed) and costs EUR 27.50 per day. This apartment is located between the 13th and 18th floor and consists of a living room, a fully-equipped designer kitchen, a private bathroom with a shower and a bath, and 2 bedrooms. A flat-screen TV can be found in the salon and both bedrooms. The maximum occupancy of this apartment is 4 people, and and 1 baby under 3 years of age (baby cot obligatory). The luxurious penthouse is located on the 19th floor and consists of a living room with high ceilings, a fully-equipped designer kitchen and 2 bedrooms. A flat-screen TV can be found in the salon and both bedrooms. The maximum occupancy of this penthouse is 4 people, and 1 baby under 3 years of age (baby cot obligatory). 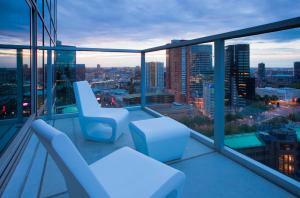 Each penthouse has a spacious balcony with outdoor furniture and panoramic city views. This Studio is located between the 5th and 13th floor and consists of a large seating area, a fully-equipped designer kitchen, a private bathroom with a shower, sink and sleeping area. A flat-screen TV can be found in the seating area. The maximum occupancy of this Suite is 2 people, and 1 baby under 3 years of age (baby cot obligatory). Each studio has a spacious balcony. This Corner Suite is located between the 5th and 13th floor and consists of a large seating area, a fully-equipped designer kitchen, a private bathroom with a shower, sink and sleeping area. A flat-screen TV can be found in the seating area. The maximum occupancy of this Suite is 2 people, and 1 baby under 3 years of age (baby cot obligatory). The luxurious large penthouse is located on the 19th floor and consists of a living room with high ceilings, a fully-equipped designer kitchen and 2 bedrooms. A flat-screen TV can be found in the salon and both bedrooms. The maximum occupancy of this penthouse is 4 people, and 1 baby under 3 years of age (baby cot obligatory). This Family Suite of 82m2 is located between the 5th and 13th floor and consists of a large seating area, a fully-equipped designer kitchen, a private bathroom with a shower, double sink and sleeping area for 2 people. In the living area there is a sofabed as well, suited for maximum 2 people. A flat-screen TV can be found in the seating area. The maximum occupancy of this family suite is 4 people, and 1 baby under 3 years of age (baby cot obligatory). Each suite has a spacious balcony. Urban Residences Rotterdam is known for its WOW factor. The 24 apartments and 54 studios are housed in the B Tower, a progressive piece of architecture in the heart of Rotterdam. The B-Tower is in fact built over well-known department store De Bijenkorf. The famous shopping streets such as the Lijnbaan and the Koopgoot lie directly at your feet. Across the street lies the Stock Exchange and the World Trade Center in Rotterdam. The famous shopping streets of Rotterdam such as ‘De Koopgoot” as the locals call it and De Lijnbaan are right at your feet. De architectural renowned Markthal, Witte de Withstraat en De Meent are ideal for lunch, drinks and dinner. All of these streets are within walking distance of Urban Residences Rotterdam. If you want to do want some home cooking, that’s no problem. You don’t have to look far for a supermarket. Supermarket Albert Heijn is just a 3-minute walk away. There are also plenty of public transport options in the immediate vicinity. 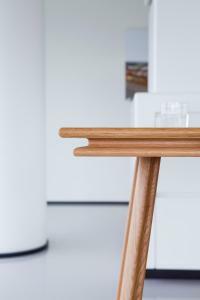 House Rules Urban Residences Rotterdam takes special requests – add in the next step! Urban Residences Rotterdam accepts these cards and reserves the right to temporarily hold an amount prior to arrival. Please be advised that the front desk is open from 09:00 to 21:00. Pre-arranged late check-in is possible until 23:59. Arriving after 23:59 is not possible. Please note that daily housekeeping services for the studio/apartment can be arranged at a surcharge. For more information please contact the property directly. Please note that supplements/extra’s will be charged at check-in time. Pre-pay cards can not be accepted. Please note that it's possible to request two single beds instead of one double bed, at an additional charge of EUR 5 per bedroom. Please note that group bookings of 10 rooms and more can not be accepted at this property. Please note that parking is available for a surcharge at our private parking garage, accessible through a parking elevator (4.90 x 2.40 x 6.6 feet, maximum weight 3000 kg) and located in the same building. Windows could have been cleaner to enjoy the nice views. Great apartment, great location! 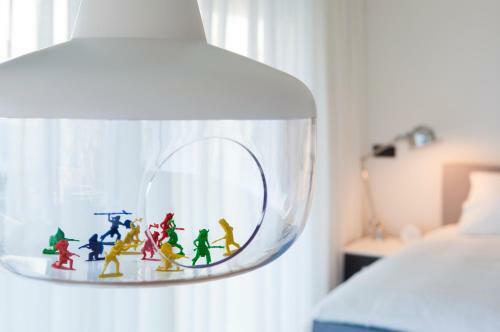 Located in the city centre of Rotterdam, surrounded by shops, restaurants, bars, musea, etc. Washing machine was not in apartment as stated. The staff were only able to offer free use of a laundry on basement level - we were on the 17th floor. Cigarette butts swept to one corner of balcony. White/neutral decor can be hard to maintain at times, glass windows create a lot of dust. Had to wipe areas on arrival. The beds were extremely comfortable, the last day we found out they reclined! Floor to ceiling glass windows provide a birds eye view of rotterdam, lovely to see at night. Fully stocked and compact kitchen island, dishwasher inclusive. Power shower in bathroom is a plus, the apartment boats luxury. Friendly and welcoming staff, building located in the heart of everything. We were able to leave our bags in the lobby for holding at check out, until we were ready to leave for the airport. 15 minute walk from Rotterdam Centraal Station and plenty of artistic/architectural structures to view in the area. I don't like that have not clean room and I need to ask for more towels and toilet paper because we were three people and they prepared the room just for two people. The manager woman staff that I just talked in the last day was a little bitte rude too. The apartament is really good, all the stuffs that you need in a home have there, and it is all modern and clean, its amazing. And the view, it is pretty. Extra cost - city tax fee was not informed until check-in. Not a large amount, but would've been great to know prior or be included as part of Booking.com price. Other accommodations stayed at in Rotterdam did not ask for this city tax; Staff - not attentive, lukewarm service; Acoustics - horrible. You can hear everything your neighbours listen to or sometimes talk about. Poor acoustic performance also amplifies the noise after 11pm ; Bed - if you value your sleep quality, do not stay here. The 'double bed' was 2 beds pushed together with a significant gap in between - not a comfortable bed and you cannot move at all; Miscellaneous - carpet under and around the bed was not laid flat, which was a trip hazard and would annoy people with OCD; some glassware came in 3's whilst majority came in 4's - just a note that it'd be consistent to replace the missing items. WAA's design was generous, along with Alessi's collaboration, the apartment was fitted out and finished well, with a luxurious feel. There is an awkward gap next to the shower pod - unsure of the design intent.. but there are isolated heated slabs which was a nice and considerate touch. This airbnb provides you with everything you need to cook yourself a nice meal like other airbnbs, but all with Alessi! 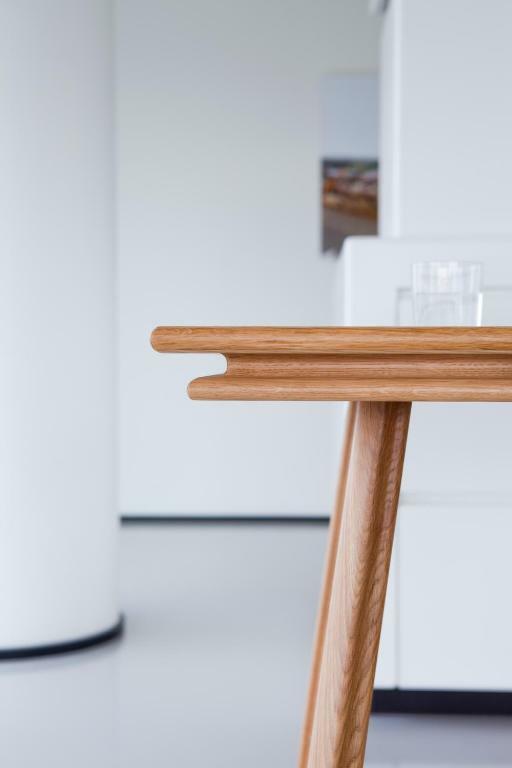 Overall, the design is a great outcome from collaboration. Perfectly located very comfortable studio. There were all the necessary appliances available for comfortable stay. The modern furnishing and the spectacular view gave us the amazing luxury experience which made our stay more pleasant. Strongly recommend. It was a very comfortable stay! We found everything we needed. Apartment’s facilities are amazing and very stylish. Very quiet, light and airy room. Very comfortable bed, great shower, cool lighting. The most incredible thing was to look at sunrise on the top of Rotterdam rooftops and the sunset reflections on the World Trade Center’s windows. Very pleasant stay! Water pressure shower was very poor! !